Mont-Saint-Michel bay, on the border between Normandy and Brittany, has not always been bathed by the sea. Around 15,000 years ago, the Channel did not exist and the bay was covered in ice. At the end of the Ice Age, around 8,000 years ago, the sea slowly advanced into the bay and the Mont-Tombe became an island. It is not the only promontory in the bay: there is Tombelaine to the North and Mont-Dol to the West. These three granite masses are 525 million years old. To the South, the bay is bordered by salt marshes, vast expanses of grass that are covered during high tide. The agricultural landscape beyond has been fashioned by dykes and polders. Mont-Saint-Michel is the site of the extraordinary spectacle of one of the highest tides in Europe. Isolated from the mainland, and surrounded by quicksand, often surrounded by a mist that quickly falls, the Mount is protected, as the tide rises and falls twice a day over the bay. During the high spring tides, the sea can recede by up to 18 kilometres. It is possible to observe the phenomenon of the rising tide from the Western terrace of the Abbey, to appreciate the panoramic views over the bay and enjoy the special events organised for the occasion. 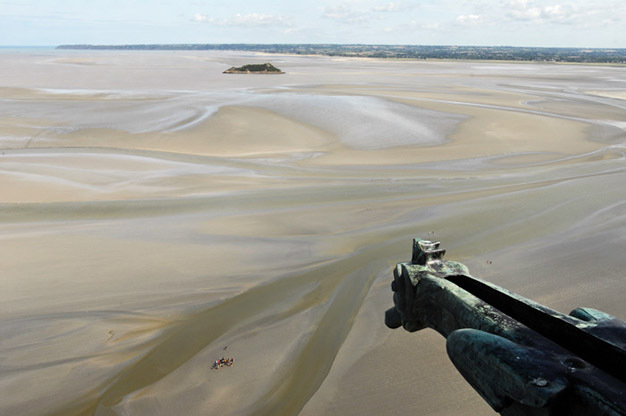 In addition to its unique character and impressive tides, Mont-Saint-Michel bay possesses many treasures. Thanks to its intertidal zone (foreshore), when the sea recedes, the bay becomes a natural reserve for thousands of birds. It is also a unique spot for discovering unusual flora and fauna... which was an integral part of its classification as a UNESCO World Heritage Site in 1979. 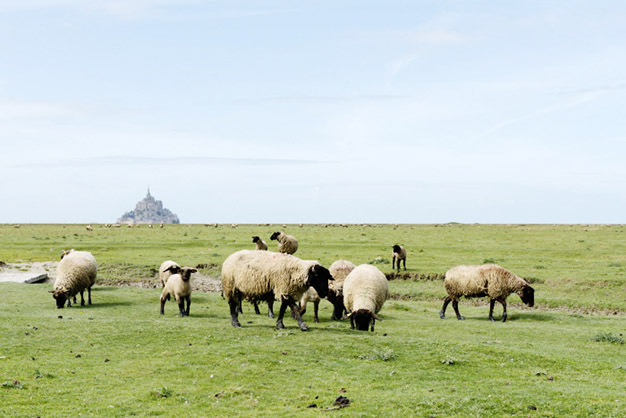 The re-establishment of the maritime nature ofMont-Saint-Michel, a long-term operation for which studies began in 1995 and work began in 2005, was completed in early 2015. The causeway built in 1878 was destroyed so that nothing impedes the circulation of traffic in Couesnon, which borders the bay. 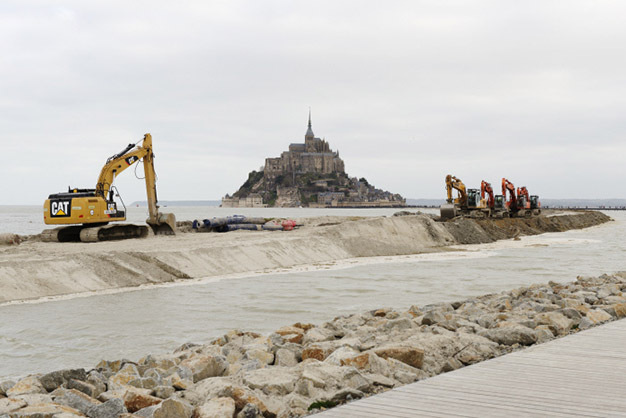 The installation of a dam and the opening of a dry causeway connecting Mont-Saint-Michel to the mainland means that the site is cut off for about twenty days each year. Mont-Saint-Michel and the machines used to demolish the causeway. (Re)discovering the Mount and its Abbey overlooking the bay can now be enjoyed as a genuine sensory experience of the sky, land and sea. 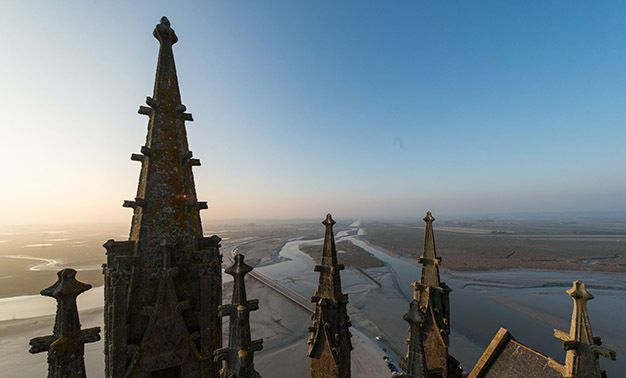 Previously threatened by sedimentation and destroyed by hundreds of cars parked at its feet, Mont-Saint-Michel has now rediscovered its natural strength and original spirit, as conceived by the builders of the Abbey.